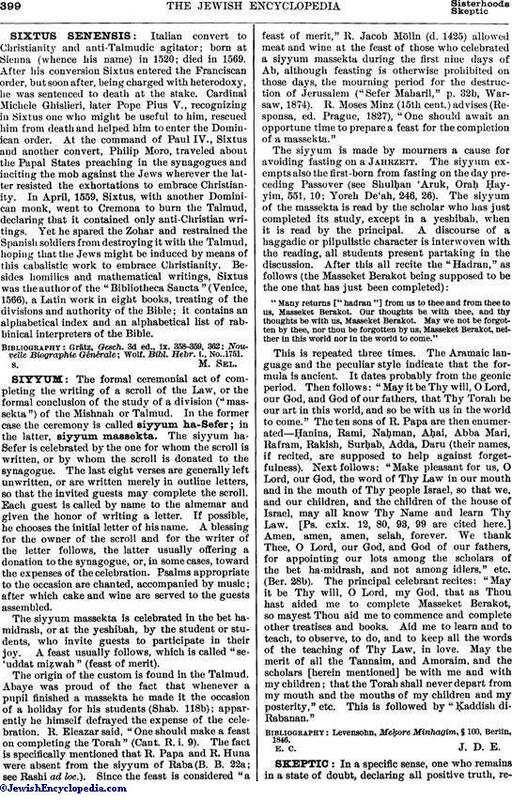 The formal ceremonial act of completing the writing of a scroll of the Law, or the formal conclusion of the study of a division ("massekta") of the Mishnah or Talmud. In the former case the ceremony is called siyyum ha-Sefer; in the latter, siyyum massekta. The siyyum ha-Sefer is celebrated by the one for whom the scroll is written, or by whom the scroll is donated to the synagogue. The last eight verses are generally left unwritten, or are written merely in outline letters, so that the invited guests may complete the scroll. Each guest is called by name to the almemar and given the honor of writing a letter. If possible, he chooses the initial letter of his name. A blessing for the owner of the scroll and for the writer of the letter follows, the latter usually offering a donation to the synagogue, or, in some cases, toward the expenses of the celebration. Psalms appropriate to the occasion are chanted, accompanied by music; after which cake and wine are served to the guests assembled. The siyyum massekta is celebrated in the bet ha-midrash, or at the yeshibah, by the student or students, who invite guests to participate in their joy. A feast usually follows, which is called "se'uddat miẓwah" (feast of merit). The origin of the custom is found in the Talmud. Abaye was proud of the fact that whenever a pupil finished a massekta he made it the occasion of a holiday for his students (Shab. 118b); apparently he himself defrayed the expense of the celebration. R. Eleazar said, "One should make a feast on completing the Torah" (Cant. R. i. 9). The fact is specifically mentioned that R. Papa and R. Huna were absent from the siyyum of Raba (B. B. 22a; see Rashi ad loc.). Since the feast is considered "a feast of merit," R. Jacob Mölln (d. 1425) allowed meat and wine at the feast of those who celebrated a siyyum massekta during the first nine days of Ab, although feasting is otherwise prohibited on those days, the mourning period for the destruction of Jerusalem ("Sefer Maharil," p. 32b, Warsaw, 1874). R. Moses Minz (15th cent.) advises (Responsa, ed. Prague, 1827), "One should await an opportune time to prepare a feast for the completion of a massekta." "Many returns ["hadran"] from us to thee and from thee to us, Masseket Berakot. Our thoughts be with thee, and thy thoughts be with us, Masseket Berakot. May we not be forgotten by thee, nor thou be forgotten by us, Masseket Berakot, neither in this world nor in the world to come." This is repeated three times. The Aramaic language and the peculiar style indicate that the formula is ancient. It dates probably from the geonic period. Then follows: "May it be Thy will, O Lord, our God, and God of our fathers, that Thy Torah be our art in this world, and so be with us in the world to come." The ten sons of R. Papa are then enumerated—Ḥanina, Rami, Naḥman, Aḥai, Abba Mari, Rafram, Rakish, Surḥab, Adda, Daru (their names, if recited, are supposed to help against forget-fulness). Next follows: "Make pleasant for us, O Lord, our God, the word of Thy Law in our mouth and in the mouth of Thy people Israel, so that we, and our children, and the children of the house of Israel, may all know Thy Name and learn Thy Law. [Ps. cxix. 12, 80, 93, 99 are cited here.] Amen, amen, amen, selah, forever. We thank Thee, O Lord, our God, and God of our fathers, for appointing our lots among the scholars of the bet ha-midrash, and not among idlers," etc. (Ber. 28b). The principal celebrant recites: "May it be Thy will, O Lord, my God, that as Thou hast aided me to complete Masseket Berakot, so mayest Thou aid me to commence and complete other treatises and books. Aid me to learn and to teach, to observe, to do, and to keep all the words of the teaching of Thy Law, in love. May the merit of all the Tannaim, and Amoraim, and the scholars [herein mentioned] be with me and with my children; that the Torah shall never depart from my mouth and the mouths of my children and my posterity," etc. This is followed by "Ḳaddish di-Rabanan." Levensohn, Meḳore Minhagim, § 100, Berlin, 1846.